Home » Make the Tour de France part of your 2017 summer holiday! The 2017 Tour de France is coming up in July and there is still time to book holidays near the route so you can be close to the action this summer! 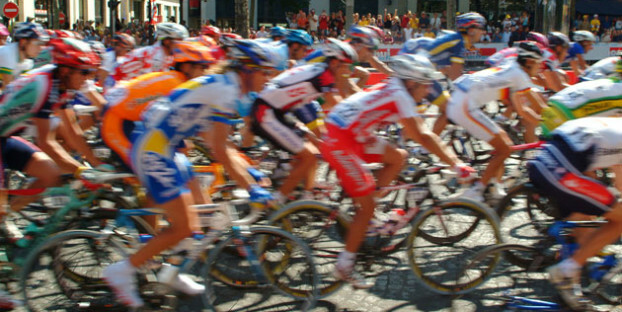 Watching the peleton pass by and experiencing the excitement and atmosphere of this iconic event is a must for any cycling enthusiast, and a great way to inspire future generations on a family day out! This year the route starts with a section that runs through southern Germany before coming back into France through the Alps and down the eastern side of France. There’s a transfer over to western France and the next stages take in Perigueux, Bergerac and Eymet in the Dordogne before the trail turns south through Ariege. The route goes back across France inland from Blagnac in Haute Garonne to Serre Chevalier in the Alps and finally heads south again through Provence to Marseille before the final stage in Paris. The most exciting stages might be the gruelling mountain climbs or the grand finale in Paris, but the terrain or the crowds can make these stages less accessible, especially for families. We’ve picked out our favourite parts of the 2017 Tour de France route for a fabulous day out spectating that ties in with your family summer holiday. On the 11th of July Le Tour travels from Perigueux to Bergerac. This is a wonderful region of France to visit with gorgeous rolling countryside, pretty historic market towns, exceptional local food and wine and sightseeing opportunities that include Lascaux prehistoric caves, and many Chateaux and gardens. We have lots of self-catering accommodation available in the Dordogne so browse and book up to enjoy a fabulous summer holiday with the added bonus of roadside seats for Stage 10 of Le Tour 2017. On 12th July Stage 11 of the race travels through Landes on the journey from Eymet to Pau. This is a great area for your family summer holiday with fantastic beaches and watersports available on the Atlantic coast and plenty of nature to explore in the forested Natural Parks. Spend Wednesday roadside with a picnic and see the peloton in action, then stick around for festivals and street parties celebrating this popular event in the villages and towns along the route. Find your perfect holiday accommodation in Landes for sun, sea, surf and cycling this summer! If you’re keen to see some more extreme endurance racing be there when the Tour travels through the Pyrenees mountains! For Stage 12 on 13th July the route goes from Pau to Peyragudes, then for Stage 13 on 14th July they continue through the mountains from Saint-Girons to Foix. The first day is long with 214km to cover and a difficult sequence of climbs culminating with the final push up to Peyragudes, the next is fast lasting just 100km – the shortest stage in le Tour. Both days will be very tough for the cyclists and are sure to be thrilling for spectators on the route! Plan an active holiday around your Tour de France adventure enjoying the gorgeous mountain scenery of this region hiking, biking and climbing. You could even relax at one of the natural spas, follow Cathar pilgrimage trails or pay a visit to top religious tourism destination Lourdes. Book a gite, chalet or villa in the Haute Pyrenees and look forward to a mountain getaway this July! On 15th July the Tour de France 2017 route travels from Blagnac to Rodez in Aveyron for Stage 14 of Le Tour. It’s a gorgeously scenic region of gorges, lakes, hills and forests that’s off the main tourist track. Plan a holiday here and explore gothic towns, beautiful villages and enjoy the delicious local cave aged Roquefort cheese. We’ve got holiday property available all over France so why not make 2017 the year you see the iconic Tour de France for yourself? Bring your own bikes or hire some here and pedal in the footsteps of the cycling gods! To find a cottage, gite or villa to rent close to the Tour de France route use our handy search facility to see availability on the map! Scroll in (or out) and move around to explore your options and find the perfect place for your holiday, and when you’ve booked, why not contact the owner for top tips on where the best roadside vantage points of the race will be so you don’t miss a thing!